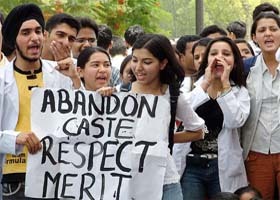 The decision to suspend the strike till May 12, was far from unanimous, but following the HRD Minister’s assurance of further discussion on the issue of reservation for OBCs, students of five medical colleges decided to call off their agitation. Agitating students of Delhi shout slogans during a protest against reservation in Delhi on Thursday. Should India and Pakistan develop a process to ensure that prisoners are not held in jail after completion of their terms? Breaking all previous records of votes polled by any Chief Minister in Jammu and Kashmir, Mr Ghulam Nabi Azad won the Bhaderwah Assembly seat today with the highest margin of 58,015 votes defeating his BJP rival in a direct contest. Brightening prospects of return of peace and democracy in Nepal, Maoists today announced a three-month unilateral truce, a move welcomed by the seven-party alliance, which vowed to remove the terror tag on the rebels and hold negotiations with them. As the Punjab Pollution Control Board today decided to cancel the provisional environmental clearance given to various mega projects, the construction work on these projects will have to be stopped with immediate effect. Seven tourists were among the 20 persons wounded in a hand grenade blast at the crowded bus stand of Pahalgam in south Kashmir this afternoon, official sources said. They said unidentified miscreants hurled a hand grenade towards security forces at a crowded bus stand at the tourist resort in Pahalgam, about 100 km from here, at 1210 hrs. The Government today extended by three months the term of Justice R.S. Pathak Committee Inquiry Authority going into the Volcker findings in the Iraqi Oil for Food scam. The decision was taken at a cabinet meeting here this evening. The quality of India-US engagement is undergoing a never-before qualitative upgradation, which is quite clear from an upcoming chain of high-profile visits from American officials to India.